Big Springs Idaho is one of the largest springs in the US, located close to Island Park, and famous for the gigantic rainbow trout that swim protected in its waters. Big Springs ID produces 120 million gallons of water a day as it forms the headwaters of the Henry’s Fork of the Snake River. This picturesque National Natural Landmark is located near Island Park, Idaho and thus makes it easy access for visitors from all over the country. Big Springs is only a 16-minute drive (a little over 10 miles) from the center of Island Park, Idaho. Take US 20 and make a right on ID Highway 84 to Big Springs. 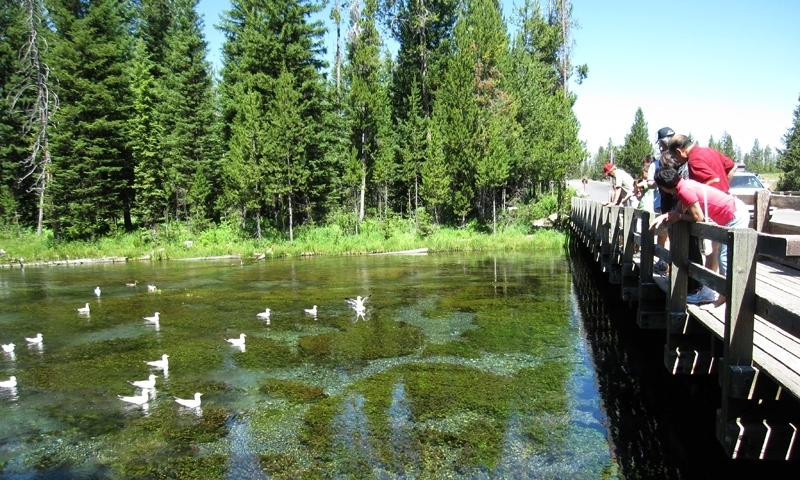 Big Springs near Island Park is open in the summer during daylight hours. Snow in winter prevents access. Although the huge rainbow trout that swim in Big Springs are protected from fishing, wildlife viewing couldn’t be better. There’s nothing more thrilling than seeing a moose wade into the water to feed on some lush vegetation. Hike around on the Big Springs Nature Trail to spot white-tailed deer, osprey, bald eagles and muskrats in your travels. Visit the historic Johnny Sack Cabin. A German immigrant named Johnny Sack built his home here and designed the cabin and all of its furnishings by hand out of the wood from local trees, taking three years to finish. A water wheel he constructed is nearby and turned by the spring water flowing from the hill. Now run by the Forest Service, this site is on the National Register of Historic Places and open from the middle of June to the Labor Day Weekend. It is one of the most photographed spots in Island Park. 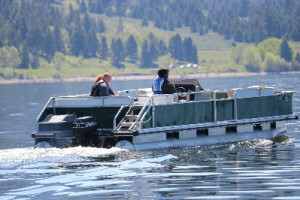 You can also rent a boat nearby to travel up Henry’s Fork River or can hire guides to take you on raft or paddle trips. This birthplace of the Henry’s Fork River is the ideal habitat for rainbow trout. The water maintains a constant 52-degree temperature and has a clean gravel bottom. Close to the shimmering pool, you’ll find a bridge where you can throw breadcrumbs to the fish and admire their size. No fishing here, though. You have to go south several miles to try for your trophy catch. 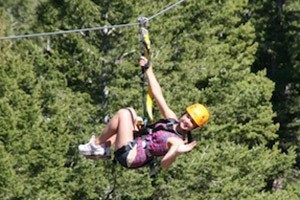 Glenwood Springs, Colorado is the I-70 Gateway to Aspen / Snowmass and the Glenwood Canyon area. It is also a very popular hot springs resort destination in itself.